What exactly are these award-winning technologies and how have they impacted society? Evolution has created the various forms of life we see all around us. The diversity comes from mutations in proteins – nature’s chemical machines – accumulating over time. Technology Overview: In 1993, Arnold (notably only the 5th female to win a chemistry Nobel Prize!) 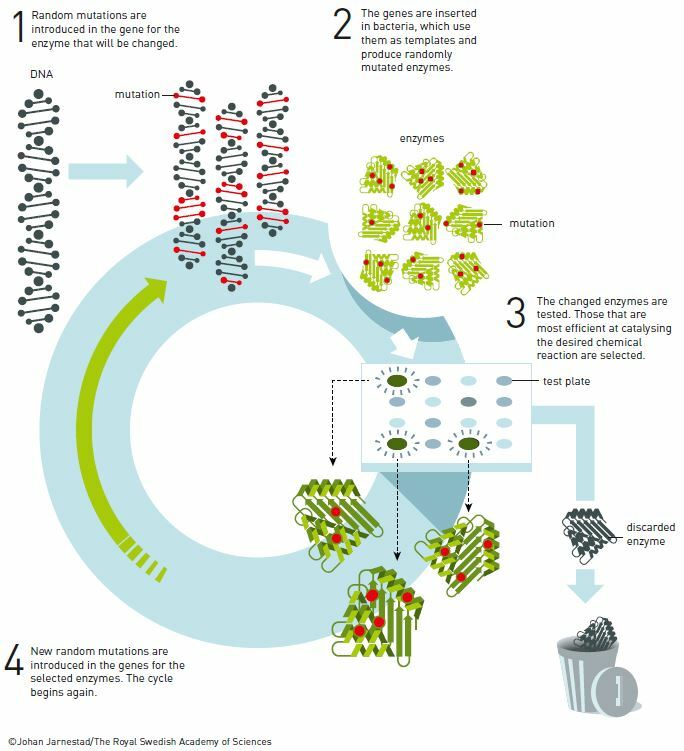 discovered a way to harness the powers of evolution – mutation and selection – to create new enzymes (proteins that perform chemical reactions). She made random mutations in enzymes then picked out the ones with desired abilities. By repeating the process, the selected enzymes could be mutated further to get better and better enzymes. Using this ‘directed evolution’ technology, new enzymes could be quickly made to control and enhance almost any desired chemical reaction. “Ultimately what it does is takes natural evolution’s billion-year process or million-year process down to what is now probably less than a week,” Paul Dalby, professor of biochemical engineering and biotechnology at University College London told the Guardian. Uses: This technology can make chemical manufacturing, including pharmaceutical and renewable fuel production, more ‘green’. The optimized enzymes created can speed up reactions or replace commonly used hazardous chemical catalysts. Smith and Winter had the similar goal of ‘directed evolution’ in mind using a different approach, called ‘phage display’. Phage (short for bacteriophage) are viruses that infect and replicate inside bacteria. Technology Overview: In 1985, Smith hijacked their bacteria-infecting powers to make them protein-producing machines. He inserted DNA sequences into phage, causing the phage to display the DNA-encoded proteins on their surface. The phage infected bacteria and rapidly reproduced to make many copies of themselves. Libraries of millions of different proteins could be made by randomizing DNA sequences introduced to phage using this technique. Antibodies (special immune system proteins that specifically recognize and bind to a target) were used to fish out phage by binding to the proteins expressed on the phage’s surface. The selected phage can be cycled back through to keep identifying better antibody binding proteins. 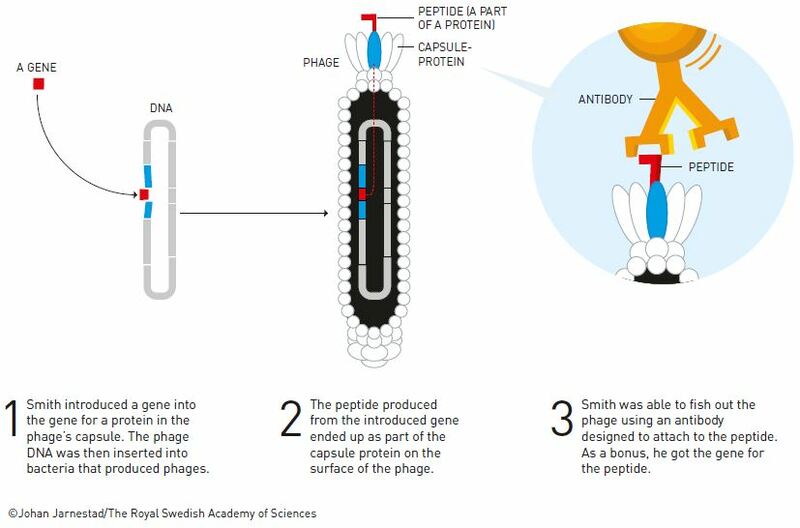 Winter flipped the process of phage display by using the phage to display antibodies (rather than proteins) then fishing out the desired antibodies that bind to molecules or even cells. The selected antibodies could be mutated and put back in the cycle to develop strongly binding antibodies. He could quickly and efficiently identify antibodies that bind to disease-causing molecules, creating new antibody drugs. Uses: Smith’s technique can link known genes to the proteins they code for and allow scientists to explore how proteins interact with their targets. Understanding protein-target interactions will help clarify how they go awry in diseases and could provide drug ideas. Winter’s technique allows for efficient antibody drug discovery. Antibody drugs are used to treat diseases like cancer and autoimmune disorders, including Humira (adalimumab), which treats rheumatoid arthritis, psoriasis, and inflammatory bowel disease. Eleven of the 15 most-sold drugs worldwide are made based on this method. “Nearly every modern therapy now is an antibody, based on using things like phage display,” said Dalby. For more in-depth information, check out the scientific background information from the Nobel Prize. Press Articles: Revolution in Evolution Wins 2018 Nobel Prize in Chemistry. Scientific American. Frances H Arnold, George P Smith and Gregory P Winter win Nobel prize in chemistry. The Guardian. Press Release: The Nobel Prize in Chemistry 2018. The Nobel Prize.